Total aliphatic and indole/aromatic glucosinolates and vitamin C content (ascorbic+dehydroascorbic acid) were evaluated in the edible portions of fresh harvested broccoli (Brassica oleracea L. var. italica) florets (Marathon cv.) before and after cooking and in the cooking water. High pressure boiling, steam cooking, microwaving and low pressure boiling (conventional) were the four domestic cooking processes used in this work. 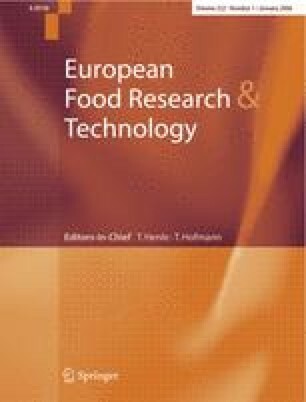 Results showed great differences among the four cooking processes and their influence on the content of glucosinolates and vitamin C. Thus, clear disadvantages were detected when cooking in a microwave due to the high loss of vitamin C (40%) and total glucosinolates (74%) in comparison with the rest of treatments. High pressure and conventional boiling had a significant loss rate of total glucosinolates (33% and 55% respectively) regarding fresh raw broccoli, due to the leaching into the cooking water. On the other hand, steaming had minimal effects on glucosinolates and vitamin C. Therefore, we can conclude that a large quantity of glucosinolates and vitamin C will be consumed in steamed broccoli when compared to the other cooking processes.